Anchor Issues Wasting Your Time? Anchor in as you normally would, keeping the sleeve up in the boat. Drop the sleeve down the rope / chain. The sleeve compresses the pins and release the coupling. By changing the retrieval point of the anchor, it is enabled to come back up the way it went down. Our simple to use device changes the retrieval point of the anchor and allows you to retrieve your anchor the way that it went in! And you can use it on whatever anchor you already have. Just slide the activation sleeve down your anchor rope and the device does the rest. The Catch’N’Release has never met an anchor it couldn’t dislodge. Having taken over the family Scuba Diving business with my brother, we have always been frustrated with anchors getting caught and decided to see what was out there, if anything, to help. 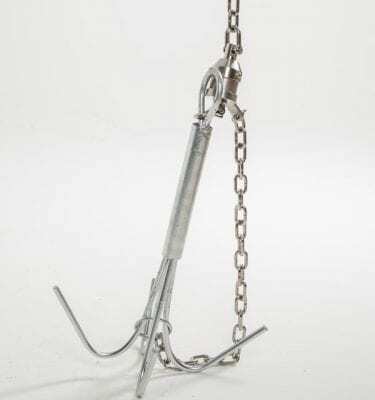 I discovered Catch’n’Release anchor retrieval and after watching the demonstration video I was impressed but remained sceptical (in my experience things don’t always work as easy in real life). This was not the case, we use it on our 11.3 metre naiad rigid hull inflatable boat every time we anchor and love how easily and well this fantastic device works! I think if you own a boat you should also own one of these. I have been telling everyone about it! I am more than happy to endorse the use of this product based on my own experiences! A day out on the boat should be exactly that – why work when you really want to play?